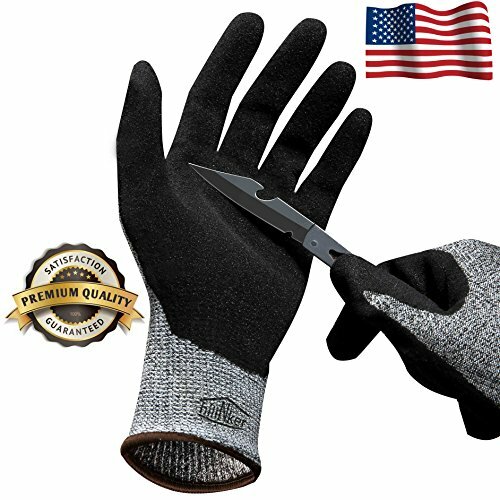 How to Choose Cut Resistant Gloves? Every day, people all over the world injure their hands at work. In fact, hand injuries are a leading cause of lost workdays and emergency-room visits. 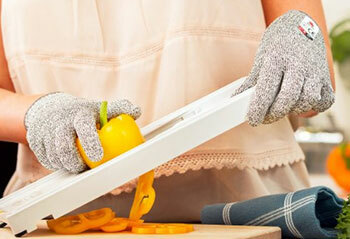 Hand injuries can be costly to anybody and rarely people know they could avoid it using cut resistant gloves. Tools such as knives, metal parts, and sharp objects are responsible for nearly 30% of the lost time work injuries in North America. About 80% of these injuries involve the hands. Most of these hand injuries could have been prevented, or at least reduced in their severity, had the right gloves been worn. Every year, about 30 percent of all workplace injuries involve cuts or lacerations; from scratches and abrasions to needle sticks, puncture wounds, and amputations. According to a recent Occupational Safety and Health Administration (OSHA) study, 70.9% of arm and hand injuries could have been prevented with personal protective equipment (PPE), specifically cut resistant gloves. Safety gloves have been evolving quickly over the last few years. The number of options you have today far exceeds those of just a few years ago. Today’s cut-resistant gloves are made from advanced materials that have revolutionized hand protection. Gloves utilize materials that are ten times stronger than steel, on an equal-weight basis. Gloves are made from the strongest fibers known to man, some of which are so lightweight and dexterous, you can pick up a dime; yet are so cut resistant 14 that they withstand repeated slashes from a box cutter. Abrasive cuts – These are very common in many industries. A prime example of a rough cut is the constant rubbing action of a glove when handling parts with a sharp or jagged edge, e.g., sheet metal stampings or plastic parts. Slicing cuts – These are characterized by the “slipping” motion of a very sharp edge. The food-handling industry is exposed to much of this type of threat. Also, any other industry where workers work with sharp knives. Impact cuts – These are not as frequently occurring in the workplace as abrasive and slicing cuts, but can happen with a far greater force. An example of this type of cutting accident is being struck by a falling piece of glass or sheet metal. On a smaller scale, impact cuts can happen in the thumb crotch area during the ordinary course of handling sheet metal or other sharp-edged materials. The fact is, leather has even lower cut resistance than cotton. In other words, if you’re handling sheet metal, and you have a choice between your average leather glove and a dish towel wrapped around your hands, you should go with the dish towel. That might be an exaggeration, but you get the point. To look at it another way, the primary reason you need cut-resistant gloves is because your skin cuts very easily. And, since leather is just the skin of an animal, it cuts just about as easily. Sometimes there is an attitude that wearing a pair of Kevlar gloves will make you invincible. This leads to workers becoming overly confident and endangering themselves by performing tasks they would not otherwise perform. Nothing is cut proof, especially not a material you could hope to move your hand in. However, technology companies have brought us new materials that are amazingly strong and ‘cut resistant’. Doing simple math and research, you can easily come to the conclusion that it is cheaper to buy anti-cut gloves than to pay for medical costs and other costs, not to mention the overall impact on healthy and other aspects. Many times people say cut resistant glove is not cut resistant, I cut them with a pair of scissors. Cutting fabric or yarn with a pair of scissors involves ‘shear’. This is a very different force from the slicing type of cut faced in industrial applications. It all depends on the type of gloves, but nothing is totally cut free. Especially in today modern word where there is much dangerous sharp objects and tools. How to Choose Best Cut Resistant Gloves? Try selecting two to five glove styles for your initial trial. Any more than five can get too confusing to track effectively. You should look at the cut-protection numbers for each style (provided in grams) as well as the abrasion resistance. I recommend selecting one glove with fifteen percent higher cut resistance or more than the 24 incumbent, and one with thirty percent or more increased abrasion resistance. Your application will determine the type of glove you want. For example, a foam nitrile glove is a good option in oily applications while simple NoCry cut resistant gloves will be good for needs in the kitchen. As much as possible, choose a range of gloves such as dotted, leather palm, palm-coated, regular string knit, etc. to determine which style works best in your application. It’s important to remember the ‘soft’ analysis. Without question, the single-most important factors are the comfort and fit of the gloves chosen. Endless safety talks, rewards, punishments, etc. will not matter if wearing a bulky glove and trying to pick up a small bolt or handle a small tool. If you choose a glove that is comfortable, conforms to the hand, and when wearing would allow you to tie your shoes or dial your cell phone, you will have contributed the single most important factor. Do the gloves shrink? If your gloves are being laundered, check special instructions. #5 How much to spend? 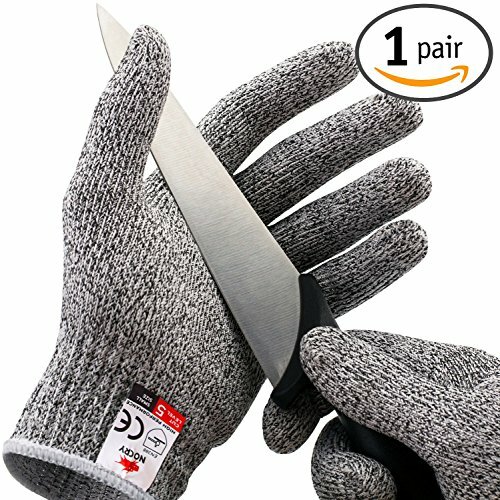 If you need cut resistant gloves for a simple task like working in the kitchen, then you can find excellent for no more than $20. NoCry cut resistant gloves are top seller gloves on Amazon. 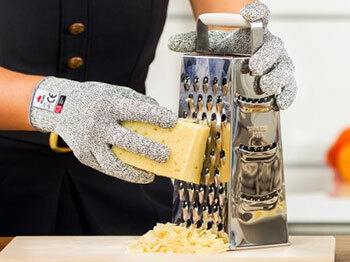 NoCry cut resistant gloves let you handle your grater, knives, and mandolin without worrying if you’ll need to bandage a finger. They are made of food safe, high molecular weight polyethylene, glass fiber, and Spandex. They have been designed to resist cuts from even the sharpest blades. You can feel secure in knowing they have an EN388 Level 5 cut protection rating. NoCry cut resistant gloves come in 3 sizes. Small, medium and large. Compared to bare hands, the elastic material in NoCry gloves makes keeping a firm grip on slippery and awkward items a snap. You’ll be able to complete tasks more quickly and accurately while avoiding nicks and cuts. 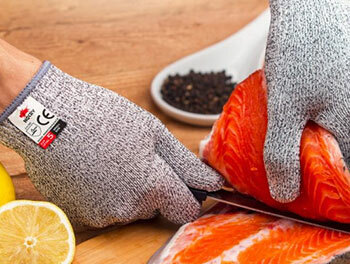 These anti-cut gloves are safe to use with food. 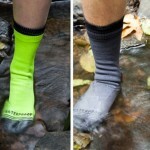 They are made out of non-toxic materials that clean easily and won’t retain harmful bacteria when washed regularly. Potential uses for NoCry gloves don’t stop with food. You can use them for woodcarving, construction, car repair, carpentry, fishing and more. NoCry gloves weigh only 0.85 ounces (24 grams) per glove. Despite this, they can withstand a sharp blade with a load of 5N for more than 20 cuts to a single spot. Gloves are machine washable. One pair can be washed up to 30 times before any loss of elasticity occurs. When washing your gloves be sure to follow product care instructions. NoCry gloves are not indestructible. 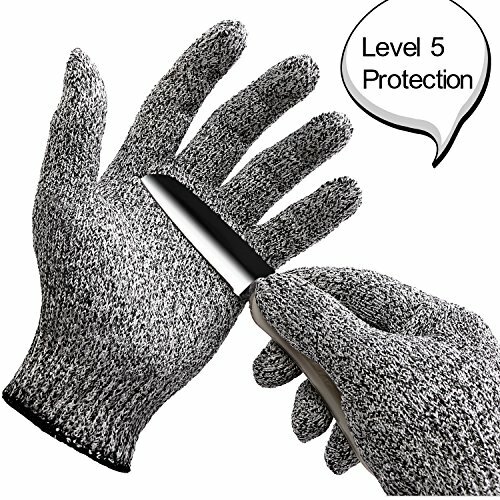 They are designed to protect your hands from bad injuries in case of accidents, but that doesn’t mean they’ll keep you 100% unharmed in all situations. 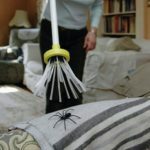 Can I use NoCry cut resistant gloves outside of the kitchen? Yes, NoCry gloves can protect your hands when you quilt using a rotary cutter, garden, pick up broken glass, make car repairs, strip copper wire, carve wood, cut hair, or anytime you’re coming into contact with sharp objects. Can both gloves fit on each hand? Yes, the gloves are flat and can be used on either hand. Do they have good grip? The grip is much better than using your bare hands and is ideal for holding items with soft surfaces, such as meat or fish. The texture of the gloves makes it slightly harder to grip firm but slippery surfaces (e.g., ceramics). They are not designed to protect against punctures. If a knife puncture were to occur, the gloves would help reduce the injury but won’t prevent it from happening. Can I use them with power tools? They are not recommended for use with power tools. They are made from high molecular weight polyethylene and silica-based fibers. These gloves are not designed to be heat resistant. Will my hands get wet if dealing with liquid? Yes, your hands will get wet since gloves are not waterproof. What does EN388 Level 5 rating mean? Performance standards for cut resistance in Europe are measured using the Couptest. In this test, a circular blade moves back and forth across the sample material under a fixed load of 5N/500 grams while rotating in the opposite direction of linear movement. The Couptest indicates how many times a cut must be made in the same place before the sample is damaged. A level 5 rating means the material can withstand at least 20 cuts to the same spot. To accurately compare the cut-resistance properties of different cut-resistant gloves, Superior Glove™ makes use of the Tomodynamometer Laboratory Test Bench. A new razor blade is loaded into the test machine at the beginning of every test. With the aid of a computer program, the machine measures the force necessary to cut the sample glove material. This is done as the razor blade travels a fixed distance across the surface of the glove material. In this way, the cut resistance of different gloves can be accurately compared. With this information, and considering the cost and comfort of the gloves, a better decision can be made about what glove is best for a particular job. Globally, there are two different performance standards for cut resistance. The European standard EN388, used in Europe, APAC, South America, Mexico and parts of Canada and the US; and the ANSI/ISEA 105 standard, mainly used in North America. These different standards are not identical and do not correlate, potentially causing confusion for end-users in their specification process for selecting the right glove for their application. It is important to understand the differences between these standards, as well as the test methodologies specified in these standards, in order to set the right expectations for performances and specifications. Several years ago, cut resistance meant wearing a clown-sized leather or cotton glove, but advancements in yarn science and glove manufacturing have allowed the words ‘cut resistance’ and ‘comfortable’ to exist in the same sentence.